3 guesses as to what the theme of this uk online slots is. If by some shocking reason you hadn’t managed to guess the theme then I can confirm that this is an Alice in Wonderland themed game. There’s a few similarly themed games about at the moment but this game seems to opt for the a beautifully designed watercolour painting aesthetic with a game board filled with Tweedle Dum and Tweedle Dee, the Cheshire cat and various card symbols. Alice in Wonderlands has a certain Victorian appeal to it but will certainly set you on your way to winning some huge cash prizes. Playson are a leading provider of online slot games with their current in house operations based out of the sunny land of Malta. Although the sun is always shining on the Maltese coastline the developers at Playson are constantly looking to new ways to innovate and develop games that really resonate with their growing and loyal audience. Their name has recently been associated with some top video and slot games uk titles such as Down the Pub, Art of the Heist, and Dracula’s Family. Alice in Wonderland is a tale that has been established in the minds of children globally for hundreds of years now. Ever since Lewis Carroll brought Alice to life, the curious psychedelic escapades of this girl and her friends has been shot around the world both across television, the silver screen and now online slot gaming. This video slot is a 5 reel, 3 row classic that manifests itself ahead of a mystical and enchanted wood where the white rabbit and the mad hatter lurk in the shadows. The foreground of this game is filled with flowers and luscious meadows while the game board rests on some ornate stone work that squares of the game board and provides a wonderful finish. Across the 5 reels and 20 paylines of Alice in Wonderslots you’ll come across a range of wonderfully enticing symbols, wilds, and scatters that can be staked on lines reaching totals that range from 20 pence all the way up to a whopping 100 pound. The symbols on the reels range from the Cheshire cat to the mad hatter and they are augmented beautifully, hanging simply across the reels and guiding you gently to special symbol alley. The Wild of this online slot is the protagonist herself, Alice. One great thing about this Wild symbol is that it can expand across the whole gameboard meaning that it can occupy a huge 15 slot spaces, this certainly means some huge cash prizes will be on offer. The Scatter of this game is a fundamental of the mad hatters tea party, the ‘Eat me, drink me’ symbol, three of these symbols will earn you a whopping 20 free spins that will be doubled if you win three or more of these scatters in throughout the free spin rounds. 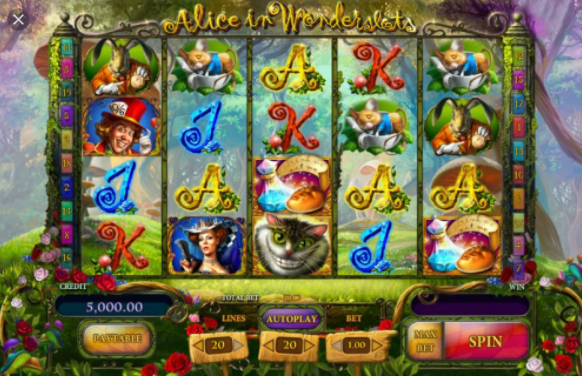 Nobody can doubt the quality of the graphics and gameplay on Alice and Wonderslots, its simply encapsulating and this is certainly visible in the vast array of gameplay options that span the wonderslots gameboard. Any Alice in Wonderland themed slots are always going to be filled with deep and mesmerising graphics, transfixing gameplay and huge cash rewards. 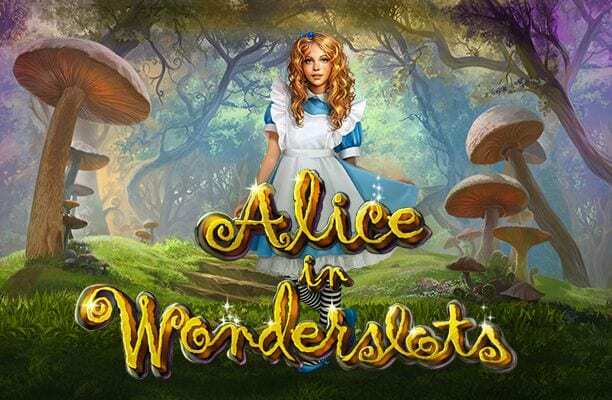 Alice in Wonderslots certainly fits the bill and is perhaps the best online slots game of its genre and it’s well worth depositing some of your hard earned cash today and meet Alice and her perilous friends; the mad hatter, the Cheshire cat and Tweedle Dum and Tweedle Dee. This is a game that is fitting for both high rollers and the small time gamers, the quick spinners and the autoplayers, but nervertheless will reap some tasty rewards for all involved. Don’t be late for a very important date with Alice in Wonderslots.